Celebrate Crafts: The Everything's ABC' blog hop letter "G"
The Everything's ABC' blog hop letter "G"
If you are looking for the Artiste/Art Philosophy Bingo hop, click HERE. For this hop we will be featuring the letter G. This may be the name of a paper, a stamp set or an embellishment. Whatever the crafter has chosen as their G element will be featured in their post. If you came from Amber's blog ~ Scrapper's Therapy then you're on the right track! For my project, I used the letter "G" on the Art philosophy cartridge from Close To My Heart. I cut out the border using an old paper packet called Typeset for the back round, and a piece of Cashmere card stock for the center. I cut both of the images at 5 1/2. I decided to make this for my youngest daughter to put on her door. For the letters in her name, I used a green called Sweet Leaf. The letters are cut from Art Philosophy as well, and they are cut at 1 1/2. The purple felt banner at the bottom is from Queen and Co. I got it a few years ago at the CK convention when it was in town. The sparkles are from my stash. I hope you like it! Very pretty! Great idea to use "G" on the AP cart! Cute! Hope you daughter loves it! Creative use of g! 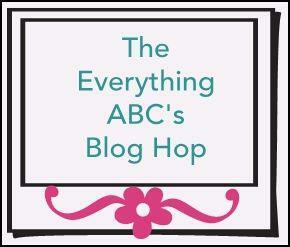 The Everything's ABC's blog hop letter "E"